At the JMM this year, I had the pleasure of attending a minicourse on “Designing and Implementing a Problem-Based Mathematics Course” taught by Bowen Kerins and Darryl Yong, the masterminds behind the legendary PCMI teachers’ program Developing Mathematics course, with a significant assist from Mary Pilgrim of Colorado State University. I’ve been wanting to get a live taste of Bowen and Darryl’s work since at least 2010, when Jesse Johnson, Sam Shah, and Kate Nowak all came back from PCMI saying things like “that was the best math learning experience I’ve ever had,” and I started to have a look at those gorgeous problem sets. It was clear to me that they had done a lot of deep thinking about many of the central concerns of my own teaching. How to empower learners to get somewhere powerful and prespecified without cognitive theft. How to construct a learning experience that encourages learners to savor, to delectate. That simultaneously attends lovingly to the most and least empowered students in the room. &c.
1) The biggest takeaway for me was how exceedingly careful they are with people talking to the whole room. First of all, in classes that are 2 hours a day, full group discussions are always 10 minutes or less. Secondly, when students are talking to the room it is always students that Bowen and Darryl have preselected to present a specific idea they have already thought about. They never ask for hands, and they never cold-call. This means they already know more or less what the students are going to say. Thirdly, they have a distinction between students who try to burn through the work (“speed demons”) and students who work slowly enough to receive the gifts each question has to offer (“katamari,” because they pick things up as they roll along) – and the students who are asked to present an idea to the class are only katamari! Fourthly, a group discussion is only ever about a problem that everybody has already had a chance to think about – and even then, never about a problem for which everybody has come to the same conclusion the same way. Fifthly, in terms of selecting which ideas to have students present to the class, they concentrate on ideas that are nonstandard, or particularly visual, or both (rather than standard and/or algebraic). While this concern resonates with me (and I’m sure everybody who’s ever taught, esp. a highly heterogeneous group), I had not named it before, and I think I want to follow Bowen and Darryl’s lead in incorporating it more essentially into planning. In the past, I think my inclination has been to intervene after the fact when somebody says something that I think will make other people feel shut out of the knowledge. (“So-and-so is talking about such-and-such but you don’t need to know what they’re talking about in order to think about this.”) But then I’m only addressing the most obvious / loud instances of this dynamic, and even then, only once much of the damage has already been done. The point is that the damage is usually exceedingly quiet – only in the mind of somebody disempowering him or herself. You can’t count on yourself to spot this, you have to plan prophylactically. 3) Designing the problem sets specifically with groupwork in mind, Bowen and Darryl look for problems that encourage productive collaboration. For example, problems that are arduous to do by yourself but interesting to collaborate on. Or, problems that literally require collaboration in order to complete (such as the classic one of having students attempt to create fake coin-flip data, then generate real data, trade, and try to guess other students’ real vs. fake data). 4) And maybe my single favorite idea from the presentation was this: “If a student has a cool idea that you would like to have them present, consider instead incorporating that idea into the next day’s problem set.” I asked for an example, and Bowen mentioned the classic about summing the numbers from 1 to n. Many students solved the problem using the Gauss trick, but some students solved the problem with a more visual approach. Bowen and Darryl wanted everybody to see this and to have an opportunity to connect it to their own solution, but rather than have anybody present, they put a problem on the next day’s problem set asking for the area of a staircase diagram, using some of the same numbers that had been asked about the day before in the more traditional 1 + … + n form. I hope some of these ideas are useful to you. I’d love to muse on how I might make use of them but I’m making myself stop. Discussion more than welcome in the comments though. T was a third grader when all this went down. 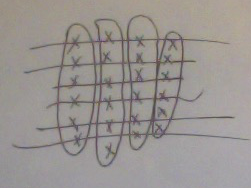 At a previous session, I had asked T what she knew about multiplication, and she had told me, among other things, that is four sixes, and because that’s 24, she also knew that six fours would be 24. I asked why she said so and she didn’t know why. I asked her if she thought this would always be true for bigger numbers, or could it be possible that there were some big numbers like 30,001 and 5,775 for which 30,001 5775’s was different than 5,775 30,001’s. She wasn’t sure. I asked her if she thought it was a good question and she said she thought it was. Me: Maybe to help study it we should try to visualize it. Can you draw a picture of four sixes? Me: and you also told me that six 4’s is also 24, right? 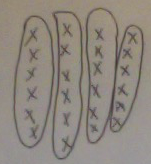 Me: – so that means that there must be six 4’s in this picture! Can you find them? Me [writing it down as well as saying it this time]: You drew a picture of four 6’s here, yes? Me: And that’s 24 dots, yes? Me: And you told me before that 24 is also six 4’s, yes? Me: So it must be that right here in this picture there are six 4’s! Me: See if you can find them! I am interrupting because I have to make sure you notice how rad she’s being. The child has a sense of mathematical aesthetics! 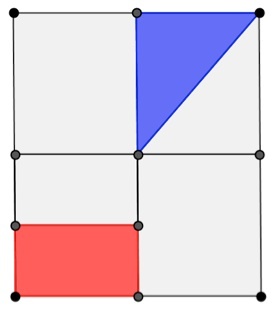 The partition into six 4’s is uglifying a pretty picture; breaking up the symmetry it had before. It’s a kind of a truth, but she isn’t satisfied with it. She senses that there is a more elegant and more revealing truth out there. Me: I totally know what you mean. It’s there but it doesn’t feel quite natural. The picture doesn’t really want to show the six 4’s. Me: You know what though. You had a lot of choice in how you drew the four 6’s at the beginning. You chose to do it this way, with the two rows of three plus two rows of three and like that. Maybe you could make some other choice of how to draw four 6’s that would also show the six 4’s more clearly? What do you think? You wanna try to find something like that? Me: Did you find out anything? Me: Hey wait I think I can see it in this one! (T: Really??) But I can’t tell because I think you might be missing one but I’m not sure because I can’t see if they are all the same. The pieces just fell into place from there. Again I don’t remember the details, but I do remember I asked her what would happen with much bigger numbers – might 30,001 5,775’s and 5,775 30,001’s come out different? And she was able to say no, and why not. Commutativity of multiplication QED, snitches! Dan Meyer’s most recent post is about how in order to motivate proof you need doubt. This is something I was repeatedly and inchoately hollering about five years ago. As usual I’m grateful for Dan’s cultivated ability to land the point cleanly and actionably. Looking at my writing from 5 years ago – it’s some of my best stuff! totally follow those links! – but it’s long and heady, and not easy to extract the action plan. So, thanks Dan, for giving this point (which I really care about) wings. I have one thing to add to Dan’s post! Nothing I haven’t said before but let’s see if I can make it pithy so it can fly too. I think it makes proving not only easier but way, way easier, and I have something to say about how. Anybody who has ever tried to teach proof knows that the work of novice provers on problems of the form “prove X” is often spectacularly, shockingly illogical. The intermediate steps don’t follow from the givens, don’t imply the desired conclusion, and don’t relate to each other. I believe this happens for an extremely simple reason. And it’s not that the kids are dumb. It happens because the students’ work is unrelated to their own sense of the truth! You told them to prove X given Y. To them, X and Y look about equally true. Especially since the problem setup literally informed them that both are true. Everything else in sight looks about equally true too. There is no gradient of confidence anywhere. Thus they have no purchase on the geography of the truth. They are in a flat, featureless wilderness where all the directions look the same, and they have no compass. So they wander in haphazard zigzags! What the eff else can they do?? The situation is utterly different if there is any legitimate uncertainty in the room. Legitimate uncertainty is an amazing, magical, powerful force in a math classroom. When you don’t know and really want to know, directions of inquiry automatically get magnetized for you along gradients of confidence. You naturally take stock of what you know and use it to probe what you don’t know. I call this the internal compass for rigor. But novice provers don’t know how to feel that subtle tug yet. If you say “prove X” you are settling the truth question for them, and thereby severing their access to their internal compass for rigor. Fortunately, the internal compass is capable of a much more powerful pull, and that’s when it’s actually giving you a readout on what to believe. Everybody can and does feel this pull. As soon as there’s something you don’t know and want to know, you feel it. This means that often it’s enough merely to generate some legitimate mathematical uncertainty in the students, and some curiosity about it, and then just watch and wait. With maybe a couple judicious and well-thought-out hints at the ready if needed. But if the students resolve this legitimate uncertainty for themselves, well, then, they have probably more or less proven something. All you have to do is interview them about why they believe what they’ve concluded and you will hear something that sounds very much like a proof. But first, what does he mean? He means giving (frankly, catchy) names to important attributes, types, and design principles, of mathematical tasks. I can best elucidate by example. Here are two words that Cody has coined in this connection, along with his definitions and illustrative examples. Jamming – transitive verb. Posing a mathematical task in which the underlying concepts are essential, but the procedure cannot be used (e.g., due to insufficient information). and then ask for a reasonable estimate of f'(4). You are jamming the power rule because you’re giving them a problem that aims at the concept underlying the derivative and that cannot be solved with the power rule. Thwarting – transitive verb. Posing a mathematical task in which mindless execution of the procedure is possible but likely to lead to a wrong answer. Of course they all try to find the area by . You are thwarting the thoughtless use of base * height because it gets the wrong answer in this case. Why am I so into this? These are just two words, naming things that all teachers have probably done in some form or another without their ever having been named. They describe only a very tiny fraction of good tasks. What’s the big deal? I have no doubt that a thoughtful, extensive and shared vocabulary of this kind would elevate our profession. It would be a concrete vehicle for the transmission and development of our shared expertise in designing mathematical experiences. Also, I know a few other actual words that fit into the category “specialized vocabulary to discuss math tasks and problems.” I forget where I first ran into the word problematic in this context – possibly in the work of Cathy Twomey-Fosnot and Math in the City – but that’s a great word. It means that the problem feels authentic and vital; the opposite of contrived. I also forget where I first heard the word grabby (synonymous with Pershan’s hooky, and not far from how Dan uses perplexing) to describe a math problem – maybe from the lips of Justin Lanier? But, once you know it it’s pretty indispensible. Jo Boaler, by way of Dan Meyer, has given us the equally indispensable pseudocontext. So, the ball is already rolling. When Cody shared his ideas, Yvonne and I speculated that the folks responsible for the PCMI problem sets – Bowen Kerins and Darryl Yong, and their friends at the EDC – have some sort of internal shared vocabulary of problem design, since they are masters. They were giving a talk today, so I went, and asked this question. It wasn’t really the setting to get into it, but superficially it sounded like yes. For starters, the PCMI’s problem sets (if you are not familiar with them, click through the link above – you will not be sorry) all contain problems labeled important, neat and tough. “Important” means accessible, and also at the center of connections to many other problems. Darryl talked about the importance of making sure the “important” problems have a “low threshold, high ceiling” (a phrase I know I’ve heard before – anyone know where that comes from?). He said that Bowen talks about “arcs,” roughly meaning, mathematical themes that run through the problem sets, but I wanted to hear much more about that. Bowen, are you reading this? What else can you tell us? Most of these words share with Cody’s coinages the quality of being catchy / natural-language-feeling. They are not jargony. In other words, they are inclusive rather than exclusive. It is possible for me to imagine that they could become a shared vocabulary of our whole profession. So now what I really want to ultimately happen is for a whole bunch of people (Cody, Yvonne, Bowen, you, me…) to put in some serious work and to write a book called A Critical Language for Mathematical Problem Design, that catalogues, organizes and elucidates a large and supple vocabulary to describe the design of mathematical problems and tasks. To get this out of the completely-idle-fantasy stage, can we do a little brainstorming in the comments? Let’s get a proof of concept going. What other concepts for thinking about task design can you describe and (jargonlessly) name? I’m casting the net wide here. Cody’s “jamming” and “thwarting” are verbs describing ways that problems can interrupt the rote application of methods. “Problematic” and “grabby” are ways of describing desirable features of problems, while “pseudocontext” is a way to describe negative features. Bowen and Darryl’s “important/neat/tough” are ways to conceptualize a problem’s role in a whole problem set / course of instruction. I’m looking for any word that you could use, in any way, when discussing the design of math tasks. Got anything for me? In fairness, for all I know, somebody has written a book entitled A Critical Language for Mathematical Task Design. I doubt it, but just in case, feel free to get me a copy for my birthday. I am taking a perhaps-undeserved dig here at a number of in-many-ways-wonderful curriculum and instructional design initiatives that have a lot of rich and deep thought about pedagogy behind them but have really jargony names, such as Understanding by Design and Cognitively Guided Instruction. (To prove that an instructional design paradigm does not have to be jargony, consider Three-Acts.) I feel a bit ungenerous with this criticism, but I can’t completely shake the feeling that jargony names are a kind of exclusion: if you really wanted everybody to use your ideas, you would have given them a name you could imagine everybody saying.